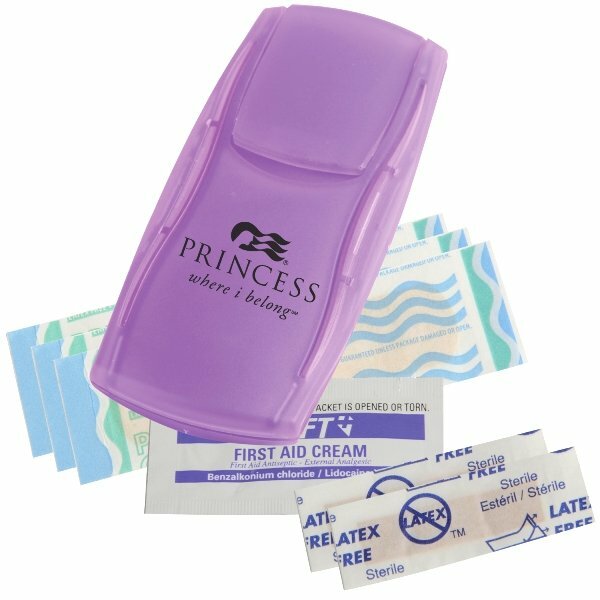 This promotional first aid kit is ready to promote your logo at the cheapest cost possible. Hand them out for senior events, hospital promotions or any consumer type event. Contains 3 regular size latex free bandages, 2 small bandages & first aid cream. The refillable Instant Care First Aid Kit is 4 1/2" x 2" x 3/8" thick. This first aid kit is Made in the USA. Price includes a one color imprint top side in area 1" w x 1 3/4" h.
Optional imprint on back is printed in an area 3" w x 1 1/8" h.
additional imprint color add a setup and $.30 each.